The ultimate chefs knife is one that will be reached for again and again and the Shun Edo Chefs knife is no exception. 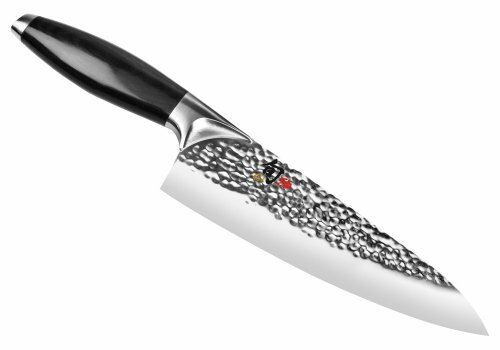 This versatile knife is essential for anyone who's passion is to cook. Made for slicing, dicing and many other food preparation tasks, The Shun Edo Chefs knife is a powerful tool in your kitchen arsenal. Designed for power and precision, Shun Edo knives feature Shuns most advanced ergonomic handle design and blade geometry. Every aspect, from the shape of the blade to the way the handle fits snugly into the users hand, has been designed for maximum comfort and control. Razor-sharp blades, handmade from pure VG10 "super-steel", allow the weight of the knife to do the work. Each blade features mirror-polished edges and a hammered ("tsushime" in Japanese) finish for supreme cutting performance while creating natural food release from the blade. Each knife is sharpened by hand to an extreme 16-degree cutting edge, making them among the sharpest available. The name "Edo", the ancient name for the city of Tokyo, celebrates the Japanese styling of these knives, made in the tradition of Japanese sword-making. Handles are made from resin-impregnated Pakkawood for strength, durability and moisture protection, while their contour provides maximum comfort. The heavy bolster encourages proper knife grip, while handles feature a slight elevation to allow full contact between the knife and cutting surface without the chefs knuckles getting in the way; while their "zero balance" provides additional ergonomic comfort. All Shun Edo knives are NSF certified for use in commercial kitchens.